French investigators have ended the second phase of their search for the flight recorders from Air France Flight 447, the French air accident investigation agency BEA said Thursday. Flight 447 went down June 1 in the Atlantic Ocean in stormy weather as it flew from Rio de Janeiro, Brazil, to Charles de Gaulle airport here, killing all 228 people on board. BEA said in a statement that the second phase of the search for the wreckage and the data and voice recorders from the plane “has just been completed.” It said that France’s oceanographic ship “Pourquoi Pas” — which carries specialized exploration and intervention vehicles, and had been leading the searching for the flight recorders — was expected in Dakar, Senegal, later Thursday. The agency said the BEA would gather a team of international investigators over the next few weeks to analyze the collected data and to discuss the requirements of a third phase. It was not immediately clear when the third phase would begin, and additional details were not given. The first phase of the search ended July 10. The flight data recorder and the cockpit voice recorder — commonly known as “black boxes” — stop giving out acoustic broadcasts after 30 days. But investigators had decided to continue listening for the “pings” for another 10 days after that. They hope the recorders will help them determine the cause of the crash. 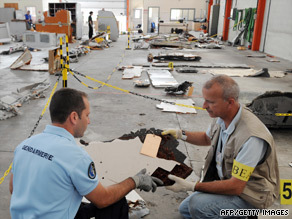 Debris from the flight recovered from the ocean’s surface is being stored in France, authorities have said. Only 51 bodies were recovered from the crash.